A flurry of recent developments in the area of human cloning provides an opportunity to once again examine its nature and purpose, how it actually works, and, if it is successful, what exactly is the immediate product of human cloning. This is all the more necessary because so much of the information the public receives on human cloning from mainstream media outlets, and so much of the public policy advocacy for human cloning for research, tends to glide over – and even totally ignore– certain key facts about what cloning is and what it does. As far back as 2005, James Thomson, the first scientist to have isolated stem cells from human embryos, accused cloning advocates of being “disingenuous” in their obfuscation regarding certain inconvenient truths about human cloning, especially in the context of regenerative medicine. Although human cloning had been the subject of intense public policy debate in the early 2000’s, over time that debate quieted considerably, so by the end of the first decade of the 21st century it had all but disappeared from the public eye. That changed somewhat when, in April, 2013, a team of scientists in Oregon announced that they had successfully created cloned human embryos, and then harvested those embryos for their stem cells. The somatic cells used in the process of creating the cloned embryos were obtained from fetuses and newborns. This was followed about a year later by two other developments. In April, 2014 a team of scientists from South Korea (which also included long-time cloning advocate Robert Lanza, chief scientific officer for Advanced Cell Technology in Massachusetts) announced that they had succeeded in creating stem cell lines from cloned human embryos, having obtained the somatic cells from adults, a 75 year old and a 35 year old. About a week later, a team from New York announced they had used somatic cells from a diabetic patient to produce cloned embryos which were then destroyed to create embryonic stem cell lines, from which were produced insulin-producing cells. The announcement that scientists had finally succeeded in using the cloning process of Somatic Cell Nuclear Transfer (SCNT) to create human embryos that were then destroyed for their stem cells was met with a relatively tepid response. By way of contrast, when South Korean researcher Hwang Woo-suk announced in 2004 that he had successfully cloned a human embryo– supposedly becoming the first ever to do so – the news became an international sensation and was hailed as a game changer for the field of regenerative medicine. The South Korean government even issued a special stamp to celebrate his achievement (by 2005, however, investigations revealed that Hwang’s research was a hoax and he had not actually succeeded in creating a cloned human embryo). When scientists first announced they had isolated stem cells from human embryos, that development was greeted almost unanimously as opening a new era in the field of regenerative medicine. Because these human embryonic stem cells (hESCs) were pluripotent– i.e.,capable of becoming any tissue type in the human body– the hope was that these cells could be used to generate new tissue to repair damaged tissue. Thus, it was speculated, hESCs could be used to develop new nerve tissue to treat stroke and spinal cord injuries; or they could be used to create new heart tissue to treat cardiac disease, or insulin-producing pancreatic tissue to treat Type 1 diabetes. Among the problems with this vision was that tissue derived from sources other than the patient (as is the case with hESCs harvested from “left-over” IVF embryos) would be subject to immune rejection by the patient, just as in any other transplantation of foreign tissue. To overcome this obstacle, many researchers began to advocate for human cloning as a means to avoid the problem of tissue rejection. Thus, in the context of regenerative medicine, the whole point of cloning is to create embryos that are the virtual genetic duplicate of the patient who donates the somatic cell used in creating them. That cloned embryo is then destroyed to scavenge stem cells that would also be genetically matched to the patient/somatic cell donor and thus, researchers hoped, not subject to rejection once implanted back into the patient. Cloning is a method to produce virtually identical genetic copies of an object (such as molecules) or an organism. That organism can be a plant or an animal. Many labs clone mice with specific genetic characteristics, in effect tailoring them for specific avenues of research. In animals, cloning is a method of asexual reproduction. The most common method used to clone animals is called Somatic Cell Nuclear Transfer (SCNT). In SCNT, a somatic cell, e.g., a skin cell, is taken from a donor. The nucleus, which contains the genetic material, is taken from this cell and transferred to an egg which has had its own nucleus removed. It is then stimulated to begin cell division. 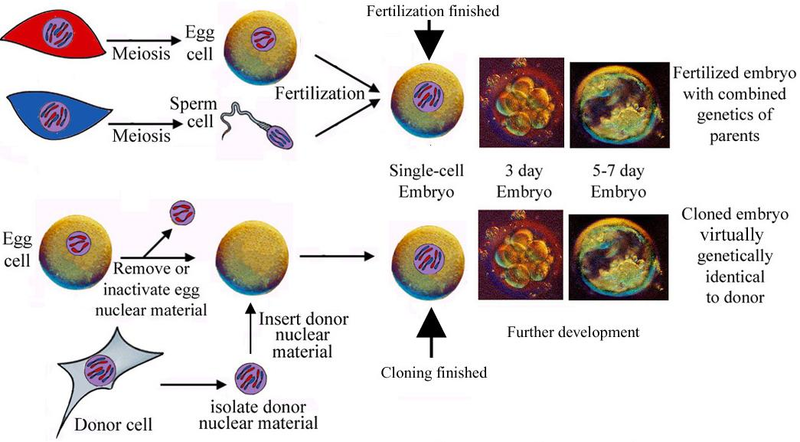 At this point, if a human egg and the nucleus from a human somatic cell were being used, and if the procedure is successful (inmost animals, cloning is highly inefficient in its success rate),i the result is a living human embryo that is a virtual genetic duplicate of the somatic cell donor. 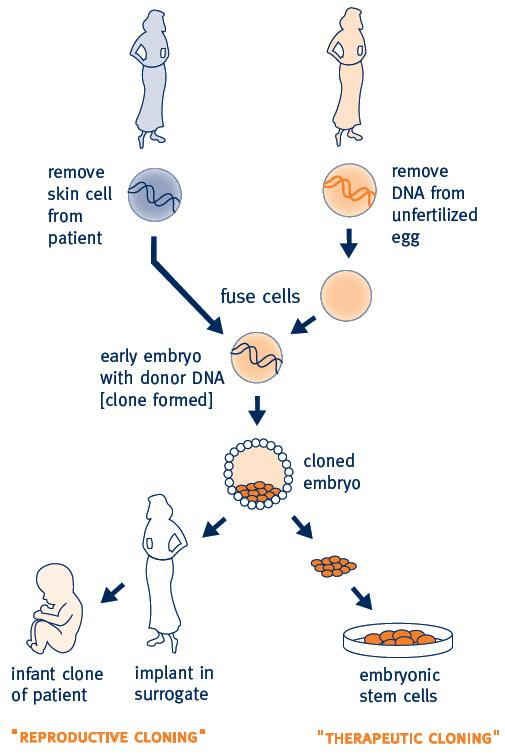 After the cloned embryo has been created by SCNT, he or she can either be implanted in a womb, or destroyed for collection of embryonic stem cells, which should also be a genetic match to the somatic cell donor. Are there two types of cloning which, by their nature, are substantially different? Many advocates of human cloning– including many researchers– say yes. The distinction, they say, is that in so-called “reproductive cloning” the intent is to create a cloned embryo and attempt to bring that embryo to live birth. In therapeutic cloning, on the other hand, a cloned embryo is likewise created, but the intent is instead to scavenge that embryo for his or her embryonic stem cells. Such a “distinction, ”however, has no scientific basis; instead, it is deliberately misleading and meant to confuse the public policy debate on human cloning. To begin, “therapeutic” cloning is a misnomer because no therapies exist or have been developed as the result of human cloning; as Stanford University bioethicists David Magnum and Mildred Cho have pointed out, the notion of therapeutic cloning is a “misconception of therapeutic use.” Moreover, “therapeutic” cloning is certainly not therapeutic for the embryo who is intentionally destroyed by the process. But more to the point, the distinction between “reproductive” and “therapeutic” cloning – based solely on the intention of the person performing the cloning process and not on the actual science of that process itself—is false: all cloning is reproductive, regardless of the intention of the person doing the cloning. This is because (as noted in the previous section) the SCNT process, if successful, will always produce a living human embryo who is the virtual genetic duplicate of the original somatic cell donor. Once SCNT is complete, the cloning process is finished. The only thing now is whether that living human embryo produced by the cloning process is implanted in a womb (the so-called “reproductive” cloning) or is instead destroyed to scavenge his or her embryonic stem cells (so-called “therapeutic” cloning). “Cloned mammalian embryos, the products of nuclear transfer, if permitted to develop to full term, are very likely to give rise to biologically abnormal or very sick individuals. This has been used by some to suggest that these entities are not genuine embryos. Following this line of argument leads to the proposition that human fetuses affected by Tay Sachs disease or Down Syndrome are not genuine human fetuses, or the children they give rise to are not genuine human beings. “Whether or not a scientist or physician intends to implant a cluster of cells does not determine whether or not it is an embryo. If it is a cluster of liver cells, for example, the intention to implant it does not make it an embryo. Correspondingly, if it is a blastocyst capable of giving rise to embryo stem cells, the lack of intention to implant it does not cause it not to be an embryo. It is just such arguments as Dr.Teitelbaum’s that Prof. Newman dismisses as “magical thinking” and that Prof. Thomson (as noted above) branded as “disingenuous” in an interview with MSNBC. Thomson rejects the notion that if cloning is done with the intention to obtain stem cells, then somehow no embryo is therefore created. A: See, you’re trying to define it away, and it doesn’t work. If you create an embryo by nuclear transfer, and you give it to somebody who didn’t know where it came from, there would be no test you could do on that embryo to say where it came from. It is what it is. It’s true that they have a much lower probability of giving rise to a child.… But by any reasonable definition, at least at some frequency, you’re creating an embryo. If you try to define it away, you’re being disingenuous. While several media outlets noted that human embryos were created as a result of the successful cloning experiments in South Korea and New York, the tendency is nevertheless to gloss over this fact. In its reporting, the New Scientist also downplayed the fact that a human embryo had been cloned in order to produce stem cells. “One team used the technique, called somatic cell nuclear transfer (SCNT), to transform skin cells from a woman with diabetes into insulin-producing beta cells that could replace those destroyed by the disease, ”the New Scientist reported, clearly giving the impression that no embryo had been created by the SCNT cloning process. Only later in the story did the report note that an embryo had been created first. In the 800-plus word report, this was the only mention of the word “embryo” and no mention was made that that embryo had to be destroyed in order to obtain the stem cells. Perhaps one reason that proponents of cloning for research seek to obscure the nature and purpose of the cloning process is that public opinion is generally opposed to the specific creation of new human life solely for the purpose of using and destroying that life for research–which is just what so-called “therapeutic cloning” does. Under the heading “Research Cloning” a VCU Life Science Poll in 2005 asked respondents if it is “[m]orally acceptable to use human cloning technology to create human embryos that will provide stem cells for human therapeutic purposes.” The question was precise and accurately described what research cloning does. Fifty- nine percent disapproved of cloning human embryos and only 34% approved. In 2006, the numbers were 57% and 35%, respectively. However, in 2006, the VCU poll also began to propose the question on research cloning more vaguely and in a less accurate manner, leaving out any mention that a human embryo was being creating solely for research, instead asking if it was “morally acceptable to use human cloning technology in developing new treatments for disease.” In 2007, the VCU Life Sciences survey stopped asking the more accurate question in favor of this less accurate one. Not surprisingly, support for this vague and misleadingly phrased proposition– to use “cloning technology” to develop “treatments for disease” and not to create embryos– has steadily risen over the years, receiving 55% support in 2010. Contrast support for the vaguely worded proposal with another poll from 2010 which asked the question in a simple, straightforward manner that captured the essence of cloning for research purposes. In the poll, commissioned by the U.S. Conference of Catholic Bishops and conducted by ICR/International Communications Research, participants were asked, “Should scientists be allowed to use human cloning to create a supply of human embryos to be destroyed in medical research? Only 12% claimed to support this, while an overwhelming 76% were opposed. Given public resistance to cloning embryos for use in research, one way to overcome this obstacle is to simply deny that this is what is being done. Make up a false distinction between “therapeutic” and “reproductive” cloning and then describe the former as simply using the SCNT process to generate stem cells in order to develop medical therapies. No embryos here. While some scientists acknowledged the technical achievements represented by the recent developments in human cloning, those developments will likely have little clinical or medical impact. Patient-matched induced pluripotent stem cells (iPSCs) can be produced far more efficiently and are already showing far more therapeutic promise than human cloning, as are other, non-embryonic sources of stem cells such as adult stem cells and umbilical cord blood. However, these developments may serve to re-open the public policy debate on human cloning: whether it should be banned outright or restricted to very limited circumstances, and if allowed, should government have any role in funding cloning for research. But an informed debate on this issue can only take place when all sides clearly understand what human cloning is and what it does. Gene Tarne is a senior analyst at CLI. i The South Korean team used 77 eggs to produce two stem cell lines, while the New York team used 71 eggs to produce four stem cell lines.